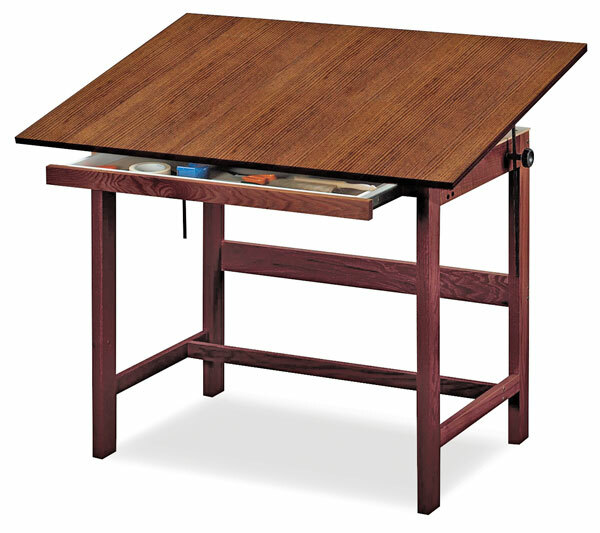 This 37" (94 cm) tall, four-post drafting table is constructed from the finest quality solid oak using through-bolt hardware to ensure it will stand up to years of use. A tilt mechanism enables the user to quickly and easily adjust the table top angle from 0° to 45°. Store tools and supplies in the convenient 31"W × 23"D × 1½"H (79 cm × 58 cm × 4 cm) drawer with dust cover located beneath the table top. Assembly is required. Limited lifetime warranty. 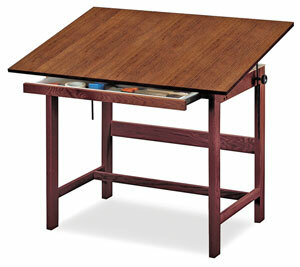 Walnut Finish — This table features a deep walnut finish that is well protected by two coats of clear lacquer. The ¾" (2 cm) warp-free tabletop surface is long lasting walnut grain melamine laminate. White Melamine Top — This table features a solid oak base finished with two coats of clear varnish for added protection. The top is crafted of ¾" (2 cm) warp-free white melamine.